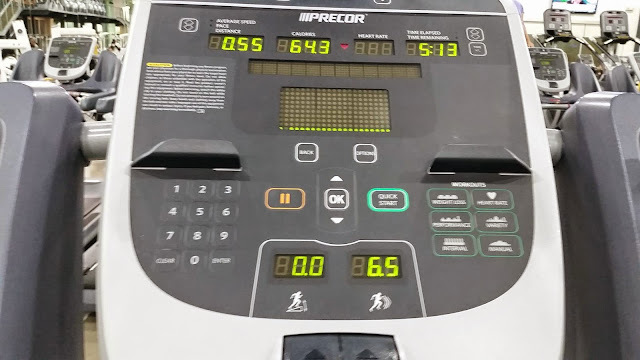 This morning I stuck to my word and changed up my treadmill workout. I started off with a quick 5 minute warm-up and then proceeded on doing some hill interval training. I typically only run one mile and then head on to the free weights. Running on treadmills bores me. It's not like I don't have televisions or music to keep me entertained. I just still get bored. Today was the first time in a long time that I ran more than one mile...and I enjoyed it! Warmup- 5 minutes @ 6.5mph. You can modify this to your jogging speed. This was a great quick cardio workout before work. It did cut into my weight lifting, but to be honest I could've kept going! This treadmill workout has a longer version, but I modified it due to time constraints. I am looking forward to newer treadmill workouts. As long as it keeps me motivated, I am all in. I would highly recommend this to any one who is bored with their regular cardio. If it changed my opinion on running on the treadmill it will change yours.